Have I told you that I love online shopping…well I am really excited about this site that I just heard about at one of my favorite blog sites Fantabulously Frugal. The site is Mr. Rebates. Head over to Fantabulously Frugal’s website for the details and a chance to win $100 gift certificate to Amazon! On a side note Fantabulously Frugal’s blog is going to come in handy for me while I am shopping for something to wear to my engagement party and engagement pictures! Hey, I just entered this contest on Cozi.com to win free groceries for a year. All you have to do is put in your email address. Even if you don’t enter, please click the link to help me win. (I get an extra entry for telling you.) Thanks! I never win anything…until today! Seriously, I spent my childhood filling out forms for Hallmark contests while my mom shopped. Never won anything. I signed my mom up and she won. I signed my dad up and he won. But I never won. I did win a coloring contest a few times- but there was skill involved, no random luck needed. I sign up for giveaways on blogs and through businesses all the time and never win. 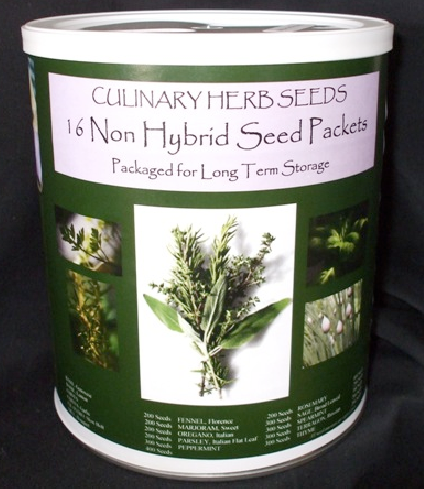 But today is a new day and I was pleasantly surprised to receive an email from Angela at Adventures in Self Reliance letting me know I have won a huge can of All Natural Herb Seeds. My husband loves gardening and I love cooking with herbs so this is the perfect item for us to win. Plus, our yard needs new landscaping, so maybe we will go with the herb garden motif. It sure sounds like there are enough seeds for that. =) Thank you, Angela and Camping Survival! If I remember correctly, I found Angela’s giveaway via Frugal Rhode Island Mama’s Monday Giveaway Madness post where numerous bloggers post their giveaways. I’m working on a big money saving project right now that doesn’t leave much time for blogging- refinancing my house. I did see a few deals that I had to pass on. The Nabisco $10/10 rebate is back here. Buy 10 participating products between 12/1/09 and 1/31/10 and receive $10 back. I did this a month or two ago and between sales and coupons was able to make money on the deal and stock my pantry with crackers for the holidays. There is a $5 off any Hallmark purchase coupon here. Be sure to print it twice. Great time to stock up on cards, get some nearly free giftwrap or use towards an ornament. You can get a free lipgloss from Estee Lauder tomorrow (12/5) from 10am to 8pm while supplies last. Go here for more details. Money Saving Mom is having 24 hours of giveaways. Visit her blog and sign up asap- I think the contests end tomorrow morning. Have a great weekend and happy savings! There are a lot of companies and blogs doing giveaways for the holiday season. I never win anything, but maybe one of you will! Here are a few that stand out to me today. Dave Ramsey is giving away something new everyday on his main page. Today it is $2,000 cash! Cost Plus is giving away gift cards ranging from $500-2,000 here. You can enter once per day here now through December 6. Brown Eyed Baker is giving away a free Kitchen Aid Stand mixer here. Frugal Rhose Island Mama has several giveaways through her Holiday Gift Guide or check out her giveaway post from Monday where over 60 people have posted their blog giveaways. There are so many blog giveaways it’s hard to keep up. If you are hosting a giveaway or have seen a great one please leave a comment letting people know what is being givien away and providing a link to the giveaway post. Thank you!